On June 25th I flew up to Alaska to visit my family for a week. 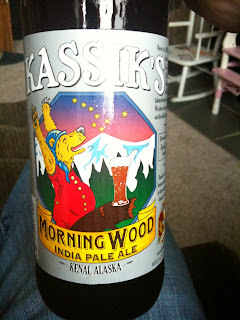 While in Alaska I thought that it only appropriate to drink only beers from my home state during my stay. I woke up in the morning and thought it was time to do some drinking. I looked in the fridge and there wan no Alaskan ales to be found. Patrick, my brother recently bought a Suzuki Samurai for an off-roading vehicle and took me out riding around on some trails. Since I had just woke up I was just wearing some work out shorts I had slept in. After working up quite a thirst on the trail it was time to get some beer at the liquor store. 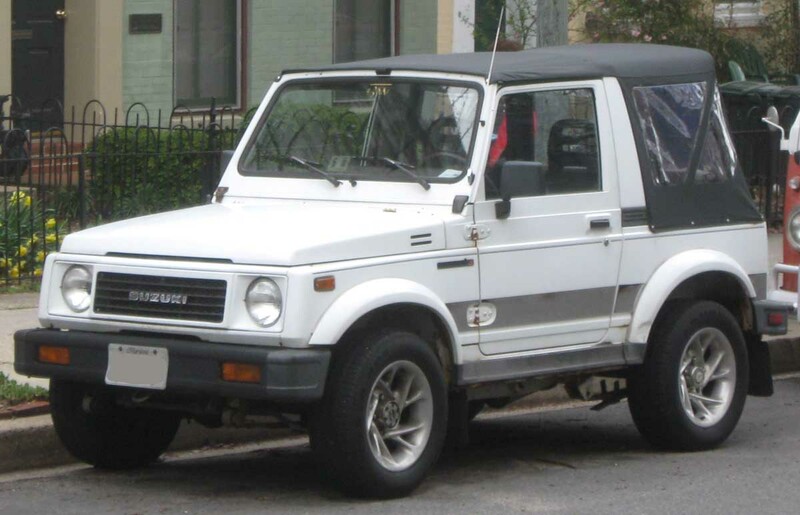 Since the Samurai is a wheelin' beast it doesn't have any doors or top which proved to be pretty cold going down the road at 60 MPH. When we got to the liquor store there was an entire section of Alaskan beer ready to be drank. The easiest method of choosing what to drink was to start at the top and work down. Kenai River Brewing- Soldotna, AK - Skilak Scottish Ale - This amber colored ale was packaged in cans. I don't think I have ever had a Scottish Ale before so I have nothing to compare it to. I wasn't really a huge fan of it. The Last Frontier Brewing Company - Wasilla, AK - Heavenly Wheat Ale Un-remarkable wheat beer, this beer made me come to a big revelation. I realized that although I order wheat beers whenever I am at a new brewery I am never really impressed with them. The Last Frontier Brewing Company - Wasilla, AK - Ruby Red Cherry Wheat Ale - This was Whitney's beer another wheat with very subtle cherry undertones. If you didn't know what this beer was called you might not be able to pick up the flavor. Silver Gulch Brewing and Bottling Company - Fairbanks, AK - Coldfoot Pilsner - Much more malty than I was expecting from a pilsner. I got a 6-pack and was hoping it would be better after another 4 but it wasn't. Kassiks - Morning Wood IPA - Kenai, AK - Possibly one of the worst "IPA's" I've ever had. Upon closer inspection I discovered that it was a English style IPA, translation too malty not hoppy enough. I really wanted to like this beer because of the clever label and because the rest of the beer line had funny labels on them too. But it was just not good. Sorry Kassik's but English IPA's are really not my forte. Darth Delirium 2010 - Belgian Dark Ale, high ABV but not an aggressive alcohol taste. Had a strong black licorice aftertaste. My least favorite beer that I tried at the moose's tooth but it may be because I wasn't really in the mood for it. Fairweather IPA - GREAT balance of maltiness and bitterness. This was a very good IPA not an ultimate hop bomb but a beer that you can drink several of. Apparently 6 different American Hops. Raspberry Wheat - Most fruit beers are offensive to my palette and they are overly fruity tasting like a Smirnoff Ice or some other headache in a bottle. This beer was not that, a good wheat ale with a small hint of raspberries but not too sweet, it was also a beer that you could drink several of. Midtown Brown Ale - Average brown ale sweet maltiness flavor and full mouth-feel. Light hoppiness with mild chocolate undertones, pretty good. I ended up getting a growler of Fairweather IPA and the Rasberry Wheat. These two were the easiest to drink and I really liked the IPA.